Oil on canvas, 39 x 61 cm. Thorvald Niss was a great admirer of the diverse landscapes of the Jutland peninsula in Denmark. He travelled to both the coast of Skagen and the heaths of Jutland, where Denmark’s nature revealed a side of itself that was both harsh and magnificent. In this landscape painting the artist has reproduced a panoramic view of the heathlands of Vendsyssel, Jutland. Heathery knolls tower majestically towards a blue sky while a wide country road snakes its way through the heath. On the highest of the knolls stands a man, looking over the expansive heath while his cows gather on the road. 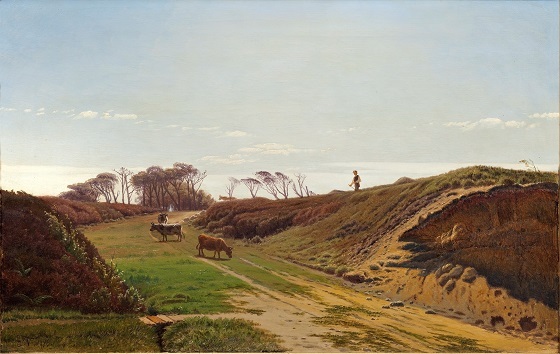 In this painting, Thorvald Niss has sought to capture the quintessential Jutland nature by highlighting the dry heathlands’ characteristically matte colours and rolling hills. At the same time, the painting appears as a snapshot of the everyday life of the Jutlander peasants on the heath.